Brows and lashes are looked at as a natural extension of hair. We have a range of colours that will enhance your brows to that perfect subtle shade. An eyebrow tint takes minutes to apply and will give your brows depth and presence. A lash tint will allow you to enjoy dark, enhanced lashes. All types of lash extension are available for all occasions. Strip lashes are the perfect quick fix for a night out. Semi Permanent Lashes are recommended for those who want a long term solution, with natural and bold options available. 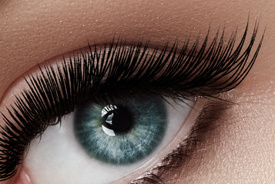 These are eyelash extensions that are applied individually with long lasting results. Good aftercare will mean that they remain beautiful for up to 6 weeks. Eyelash perming will keep a lasting curl all the way through the life of the eyelash (around 90 days). The natural process of shedding old lashes and regrowing new fresh straight eyelashes, means perming can be performed again and again about every 2 months. 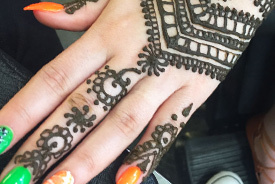 Henna can be used as body art that is created using a paste made naturally from leaves. We offer freehand, unique modern designs for every client. Our henna can last up to about 2 weeks. It is best not to wash off the henna once it has dried, but instead to let it flake off itself naturally. It takes about 24 hours for the colour to enhance and darken. The resulting colour of your tattoo is dependent on your body heat. Please note that we do not use black henna because it is seriously harmful to the skin. Add a little temporary bling and a sparkle to your smile with one of our tooth gems. Smilegems are beautiful Swarovski crystals from Swarovski crystal components, applied to the tooth in minutes without drilling or pain. Smilegems will not harm the tooth and can last for up to one year. HD Brows is a seven-step eyebrow shaping treatment that focuses on shape and design. It involves the combination of techniques, including tinting, waxing and threading, using specialist HD Brow products. Absolutely! Brow shapes are tailored to the individual as they have to suit your look and personality. Your brows can be made dark or light, thick or thin, sharp or soft. The length of time your results last depends on how quickly your hair grows back and how well your hair holds the colour. On average, you’ll need them done every 4 weeks. Yes. Your stylist can put you on a regrowth programme that will train your brows into shape over a course of visits. To speed up your regrowth and make your brows look better between visits, there are HD brows products that will stimulate regrowth and make your brows appear full and defined. Facial waxing services are offered at all our sites, including eyebrows. We offer "Arm waxing" as well.